Hoje aconteceu no mundo todo a 46º Maratona Mundial de Desenho - Sketchcrawl. Aqui em São Paulo nós fomos conhecer a Vila Maria Zélia, uma interessante vila situada no bairro do Belenzinho. A Vila Maria Zélia foi construída como uma vila operária, nos anos de 1920. Conheça mais sobre a história deste local, neste post do site São Paulo Antiga. Fiz vários desenhos, muito empolgado pelos temas cheios de caráter e expressão. Aquarelas realizadas em uma viagem à Santa Catarina, no munipio de Bombinhas. Dificil pintar aquarela na areia da praia, sob calor intenso, mas muito prazeroso. Curti bastante estes momentos! Feitas em bloco de papel Arches, formato 25x10cm. 16º Turma do Curso do Bajzek! Começaram as inscrições para 16º Turma do Curso do Bajzek! O Curso do Bajzek, em seus diversos formatos, já atendeu cerca de 500 alunos, nas cidades de São Paulo, São Luis, Fortaleza e Brasília. Também fui instrutor no 3º e 4º International Urban Sketching Symposium, na República Dominicana e Barcelona, respectivamente. Nesta turma, contamos com ótimas oportunidades de descontos, incluindo descontos especiais para grupos! I loved the way Marc Taro Holmes finishes the introduction of his book with this meaningful phrase “the city becomes your studio”, inviting people to go out on the streets and sketch on the spot - an “artistic adventure”, he says. 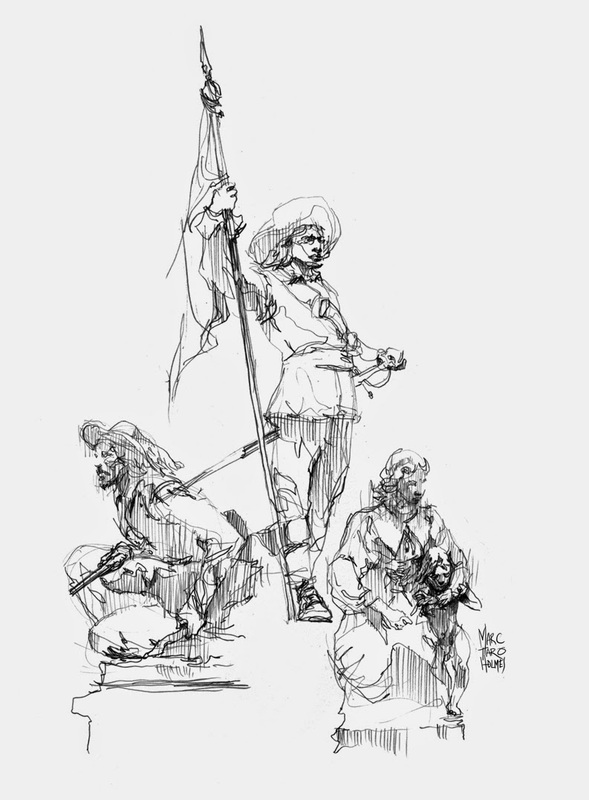 He emphasizes that sketching on location provides you “freshness, direct impression that can’t be matched”, as encouraging as this is for amateurs and experienced artists. I’ve always been a fan of Marc’s work, and now I certainly know why, after reading (and studying) his book. It becomes clear to me that he has a perfect understanding of his own process of working, as he’s able to clearly talk about it, sometimes even using his own imaginative vocabulary. It was inspiring to realize that he developed his skills through passionate practice, as he mentions all kind of subjects he worked on, such as a tattoo shop or a cemetery. His process seems to be shaped over precious insights as he experienced the world through drawing. He even shares his own mistakes, where you can learn a lot from. As you go through the lessons you will find statements to be written on the top of your sketchbook page, like this one: “Oddly, it’s the measuring that allows the sketch to look spontaneous”. I actually copied, word by word, dozens of things like this, which were suitable for me. 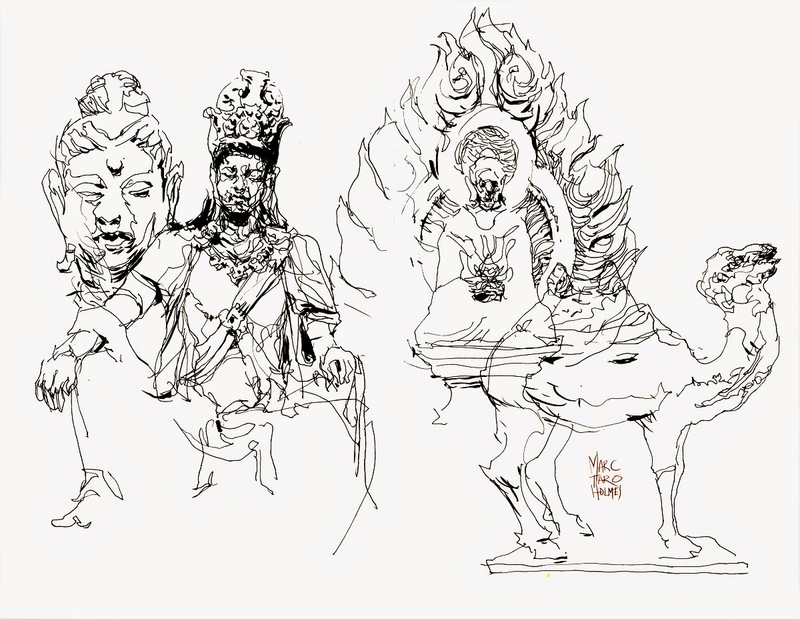 He divides the process of drawing and painting into three passes, in terms of techniques (pencil – ink – brush) and approaches (scribble - calligraphic line - spot blacks). He finishes explaining in details the process of creating watercolor paintings through his wonderful “Tea, Milk and Honey” process (in my opinion, there is no other way one can explain the dynamic of watercolor better). I love the idea of working in layers of information in a drawing. I specially appreciate the variety of lessons on how to sketch people, as I personally struggle in this area. He uses every sort of situations, from people standing (almost) still to people dancing in a street performance. The book ends with a beautiful gallery of images for your amusement. You can find dozens of his artwork on the internet. Go look at them - studying this book will be tempting. “Avoid scratchy, searching, hesitant lines that come from repeating a stroke over itself multiple times”. “Where an ink drawing has drama and power, a painting in full color has the potential for many moods, and for more compelling, more sophisticated storytelling”. 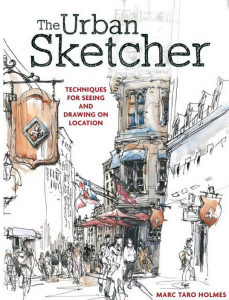 "Watercolor is portable, transparent and fast drying – ideal for urban sketching." Em breve, a resenha do livro também em português!